Smart features, new technology and massive power! A modern design, 16 MP camera, built-in heart rate monitor and personalised security features make the Galaxy S5 a truly smart buy! The Samsung Galaxy S5 boasts of a glamorous new design and smart new features that set it apart from run-of-the mill smartphones. It is the first phone with a built-in heart rate monitor! It’s because of milestones like these that it has phone fanatics and tech lovers gushing over it. 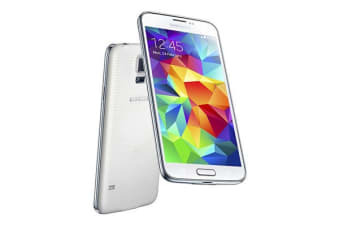 Housing a Qualcomm 2.5GHz quad-core processor and 2GB of RAM, the new Galaxy S5 packs substantially more power than its predecessor. For you, this translates to even faster speeds! A design that sets it apart! Using the Samsung Galaxy S5 is a breeze thanks to Android 4.4 Kit Kat. So, go ahead and enjoy all the smart, user-friendly features you know and love so much! With a big 16MP rear-facing camera and 2.1MP front-facing camera, the S5 has really taken a giant leap in the camera department. Not only does the auto-focus work incredibly fast, the camera also allows you to refocus an image after you’ve taken it! But wait! There’s more – the new camera can also shoot 4K/UHD video at 30 frames/second. All these additions ensure that you capture the best shot of things happening around you. Take advantage of the Biometric fingerprint scanning on your S5! It can store up to three fingerprints so that only you or someone you trust can gain access to the important data on your phone. The S5 features an optical heart rate sensor that lets you check how hard your heart is beating as you exercise. It also includes an improved version of S Health, the app that helps you track and achieve your fitness goals! With all these handy features, you’ll surely be motivated to stay fit! The S5 is also ready to face difficult weather conditions with an IP67 certification! It stays protected against sweat, rain, sand and dust letting you work and play without any worry! Tap into the fastest connections ever by pairing your Galaxy S5 to your 802.11ac Wi-Fi. *This device is rated IP67, using the Ingress Protection rating system. The dust rating is 6 (highest level of protection), and the water resistance rating is 7 (water-resistant up to 1 meter for up to 30 minutes). Despite this classification, your device is not impervious to water damage in any situation. It is important that all compartments are closed tightly. Click here for more information on maintaining water and dust resistance. This device is compatible with 4G networks. Experience mobile internet faster than you ever could have imagined. Bluetooth lets you wirelessly connect to a host of accessories and peripherals. Transfer files, use hands-free kits and stream media quickly and easily. Enjoy a more polished design, improved performance, and new features. KitKat includes full-screen immersive mode, 'Ok Google' commands, improved multi-tasking, low-power audio playback, printing and Chromecast support, HDR+ photography, access to thousands of apps and games on the Google Play Store and much more. This device is capable of a level of water resistance. This may range from light water spray, to full water immersion for a short period of time. New the product well so rather than up date went back to s5. It is a quality product and just what we required. Meets my requirements. Enough features. Easy to use. Easy to migrate my old samsung phone content using Smart Switch.